I received an e-copy of this book from Hodder & Stoughton through Netgalley in exchange for an honest review. Yay for adorable summer books that will make you smile. This book for me, was interesting in its depiction of Indian culture, including the use of Hindi and arranged marriages. Where I live there is not a strong Indian based community and as such, although being aware of the culture I don’t have a real world example to base this book on. The writing by Sandhye Menon is engaging where the characters have clear defined personalities. Dimple isn’t the traditional Indian girl that her mother may wish she was, instead she sees herself more American than Indian and wants to succeed in a market that is heavily dominated by white males. Rishi on the other hand is the son his parents always wanted, dedicated and interested in his culture he will follow their wants over his own. The plot revolves around a miscommunication and a convention where the future of tech development compete against each other to receive backing for an app. The humour of the situations that arise due to this is constant through-out the book allowing for a plot point which may have been viewed poorly to be seen in a new, modern light. It shows how traditional views can be adapted to modern customs and how sometimes, love will happen no matter how hard you try to pull away from it in a bid not to conform. 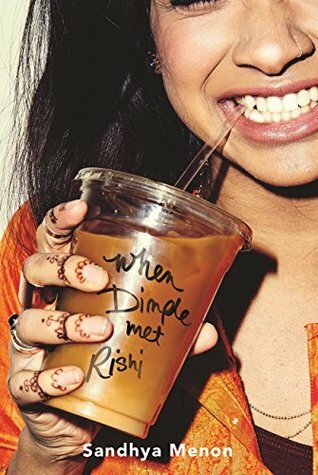 The cover of the book ties in well with how Dimple met Rishi, as you will read (because I know you will read this) the meeting does literally revolve around coffee. The visual impact of the cover is something that many people will associate with their lives, buying a coffee. The story skims over the programming element of the plot quite often but the competition is alive throughout along with the expected drama that ensues from this. So why read this book? Read this because it is funny, it is a summer must read and it is always good to broaden the mind.